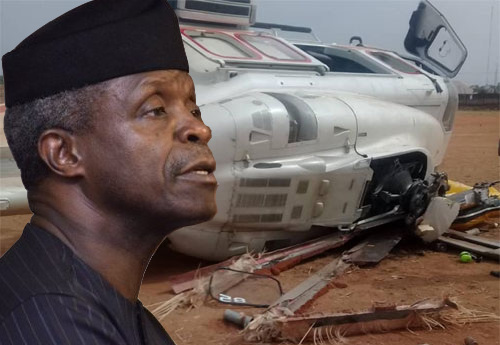 Vice President Yemi Osinbajo has testified about his escape from the helicopter crash. The helicopter conveying the Vice President to Kogi State had crash-landed, though no one was injured and all the crew and passengers had escaped. Taking to the podium on Sunday morning as he worshipped at the Redeemed Christian Church of God, City of Grace Parish in Lokoja, Kogi State, the VP testified to the goodness of the Lord for his deliverance. He then proceeded to Idah to continue his engagements with his political campaigns seeking reelection of him and President Muhammadu Buhari, tagged NextLevel. His first port of call was at the Ata Igala’s Palace. VP Osinbajo worships at the RCCG City of Grace parish, Lokoja, testifying to the goodness of the Lord for yesterday's deliverance & then proceeds to Idah continuing the Next Level engagements. First port of call is Ata Igala's palace.